The Richmond Art Gallery hosted an International Mail Art Exhibition & Swap from November 17, 2013 – January 12, 2014. The exhibition was an “open call,” inviting artists from around the world to send in up to three artworks in any medium measuring 4” x 6” (10 x 15cm), responding to the theme of “memory.” This broad theme was in connection to the adjacent exhibition in the Gallery at the time, Margaret Dragu – VERB WOMAN: the wall is in my head/ a dance of forgetting. This exhibition was not juried and, following the original tenets of Mail Art, all were welcome to participate. Traditionally, Mail Art (aka Postal or Correspondence Art) is a non-commercial art practice where artists exchange artworks through the postal service. Initially seen as a way for artists to distribute art outside the existing gallery system, Mail Art as a practice has continued to grow and evolve throughout the 21st century. The exhibition is intended to be a cultural exchange for both the artists and the gallery/online audience. Artists receive a new artwork at the end of the exhibition as part of the “swap,” and are able to share their works online. For the viewer, the exhibition presents a glimpse into a considerable number of artists’ works from all over the world, many of whom may have never before exhibited in Canada. In response to the open call, over 700 artists from 46 countries mailed in over 1300 artworks, making this the largest group exhibition held at the Richmond Art Gallery. We thank all the artists involved in this exhibition, and are pleased to share all the works with our online community. View the gallery of each trading card in the exhibition. The online component of this exhibition would not have been possible without the hard work of our volunteers Madison Bentley, Sarah Third, Silvia Sasaki, and Natalie Worth. Thank you! 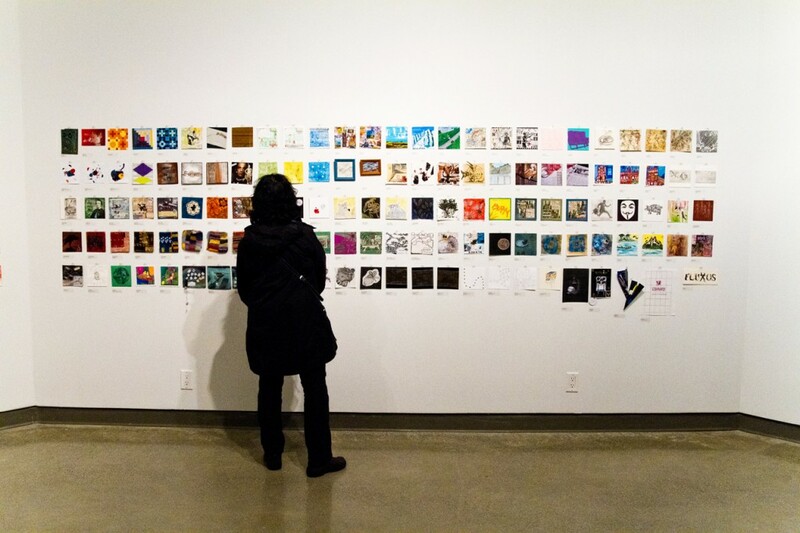 Above: Gallery visitor viewing one wall of the International Mail Art Exhibition: Memory, 2013.